As we start the month of October, we are still very much in an active portion of the hurricane season, which does not formally end until November 30th of each year. 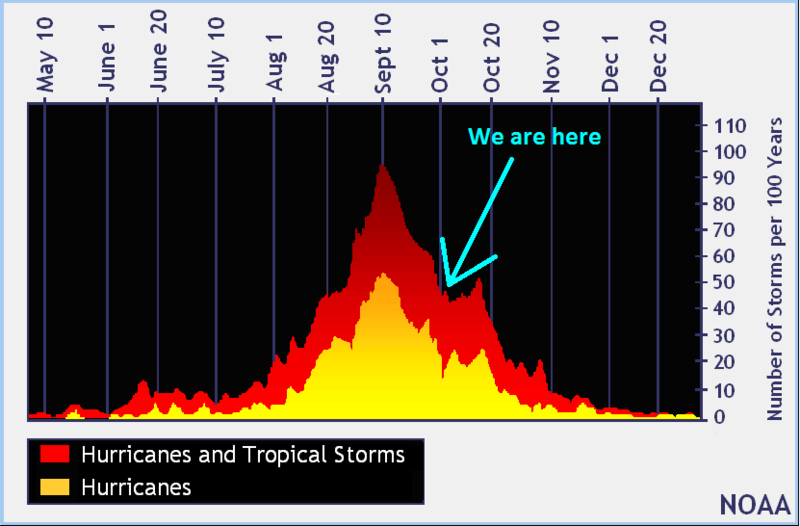 The Tropical Cyclone Climatology graph below represents where we currently are on the timeline in the Atlantic basin. Even though we are transitioning downwards, October has shown some very powerful hurricanes in the past. 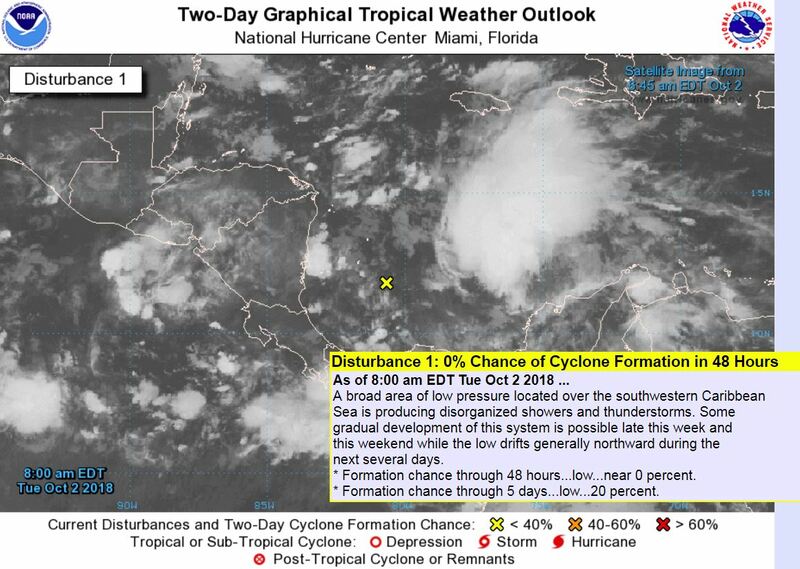 This morning, the NHC highlighted an area of disturbance in the western Caribbean Sea with 0% chance for development next 48hrs and 20% chance next 5 days. 1. 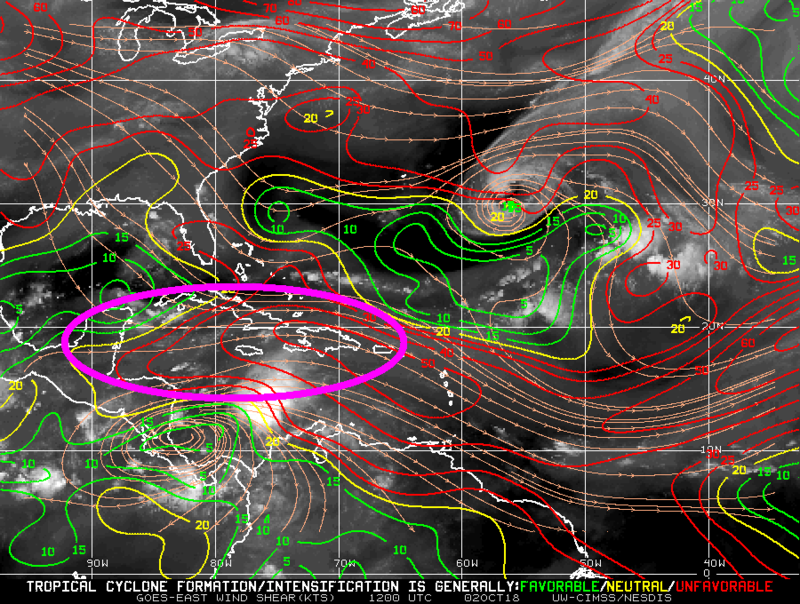 PWAT increase (precipitable water) as moisture piles up across the Caribbean along an Easterly trade wind surge. 2. 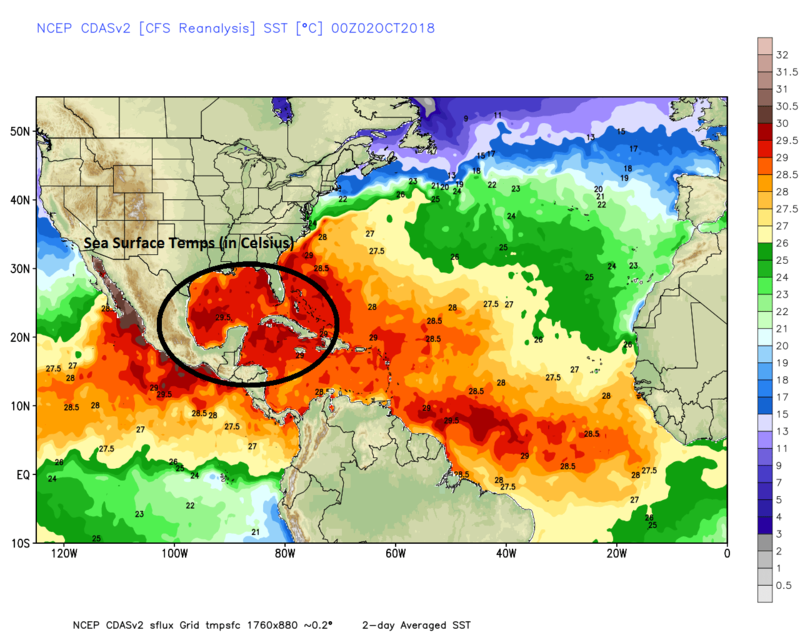 TCHP (tropical cyclone heat potential) is VERY high there as Sea Surface temps are very warm and very deep – lots of surface fueling there and extending to its north from the western Caribbean into the Gulf of Mexico. 3. Broad area of low pressure development ongoing – all it takes is aggregation of T-storms to create rotation of the atmosphere over that area. 4. 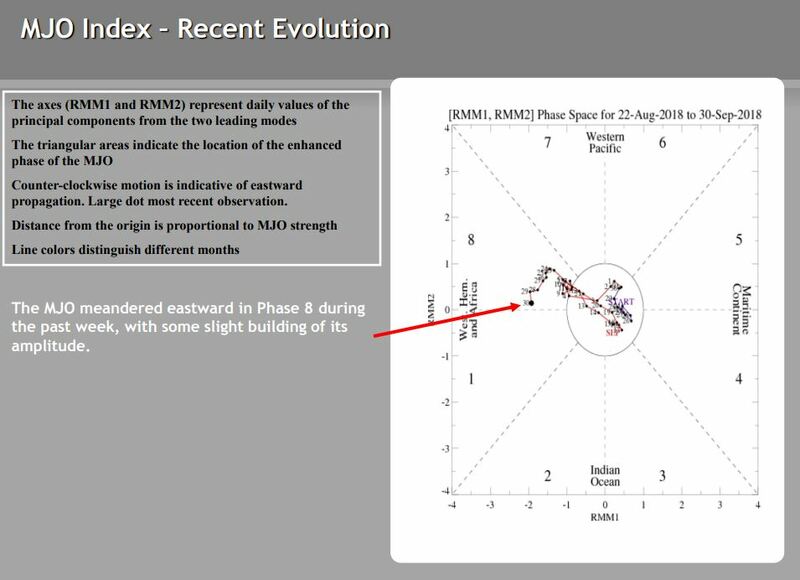 MJO (Madden-Julian Oscillation) – this is an area of atmospheric coupling of tropical deep convection and atmospheric circulation – it pulses eastwards over the Indian / Pacific Oceans and signals over the Atlantic basin as well during “Phase 8” (which it is now). 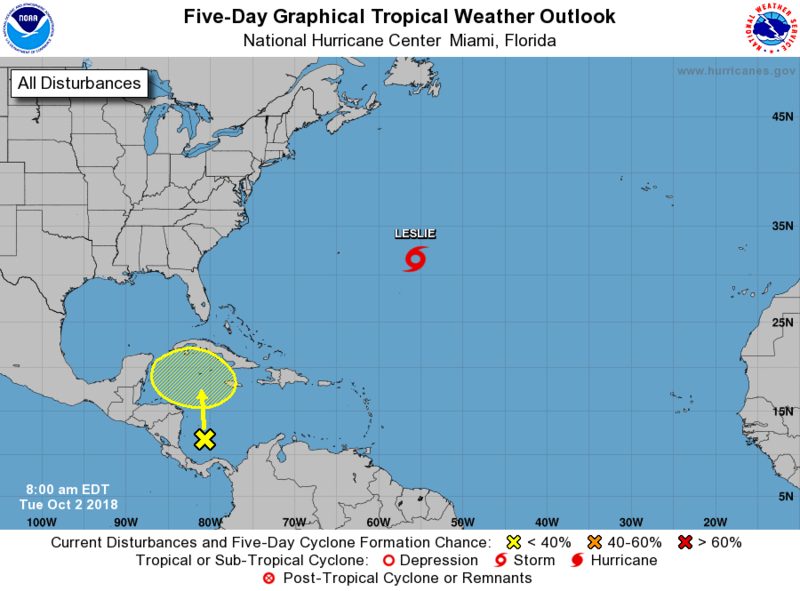 In short….this is like a steroid enhancer for tropical activity if the conditions are right. ONE major limiting factor is that upper shear is strong over this area and will continue to be strong for the next several days. 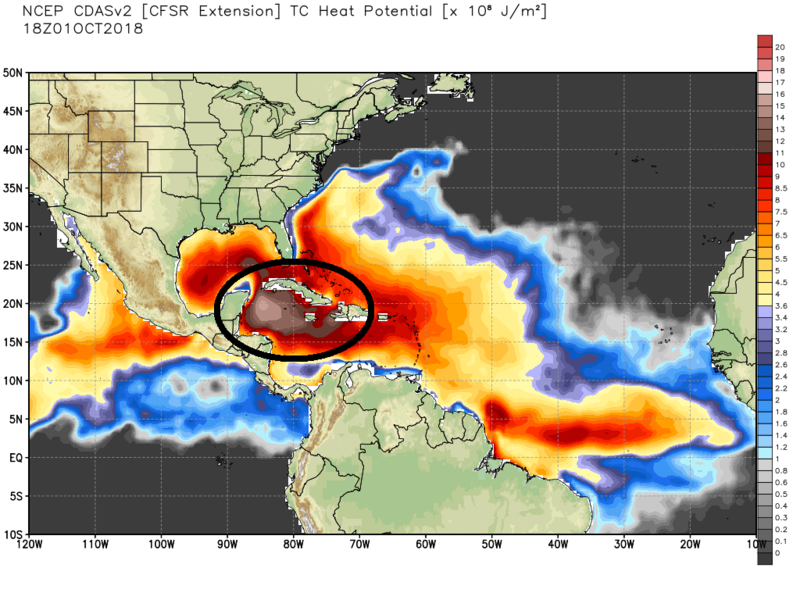 If or when this disturbance lifts north away from it, the Gulf of Mexico waters are very warm and ripe for development. We will need to keep a close eye on this and any other tropical waves that attempt to develop in this part of the Atlantic basin. With such an abundance of surface fueling, a good portion of the setup for rapid intensification is there. We saw what happened to TX last year as Harvey intensified quickly into a Cat 4 storm before hitting the coast, so it is always good to have a plan at all times. Stay safe and let’s hope we transition through the rest of the hurricane season without anymore land-falling storms!